February in Italy is infiltrated by masks, confetti, colors, and lights that create a very exciting and unique atmosphere. Carnival is a huge winter festival celebrated 40 days before Easter and ends on Shrove Tuesday (Fat Tuesday or Mardi Gras), the day before Ash Wednesday. It is not a single day or event, but a whole season of masquerades and fun for people of all ages, especially children who really love it. When I was a child, I looked forward to it all year long because every Sunday you could run through the town square wearing costumes that represented cartoon characters or superheroes while tossing confetti to create a rainbow shower for passersby. Pranks are also common during Carnival, hence the saying: “A Carnevale ogni scherzo vale”, “anything goes at Carnival”. During this time, you could even prank your classmates and not punished for it. It was fantastic! Carnival has its roots in pagan festivals, and traditions are usually adapted to fit in with Catholic rituals. Historically, it was the last chance for Catholics to indulge before they gave up meat (traditionally) for Lent, though today people give up all sorts of other things for Lent. The name for the festival in Italian is “Carnevale” the word “carne” means meat in Italian. It was perhaps not only a last chance to indulge, but also an opportunity to consume any meat that had been put up for winter that might not stay fresh enough for consumption until spring. The tradition of getting dressed up at Carnival is one that dates back to a time when the class system played a major role in society. It is celebrated in many different ways, varying from region to region, and city to city. Venice, Viareggio, Putignano, and Ivrea are towns that hold the biggest and most elaborate Carnival festivals in Italy. Carnival in Venice is very refined, elegant, and chic. Masks (maschere) are an important part of the Carnival festival and Venice is the best city for traditional masks. Its traditions began as a time for celebration and expression throughout the classes because wearing masks hid any form of identity between social classes. Today, approximately three million visitors come to Venice for the celebrations. 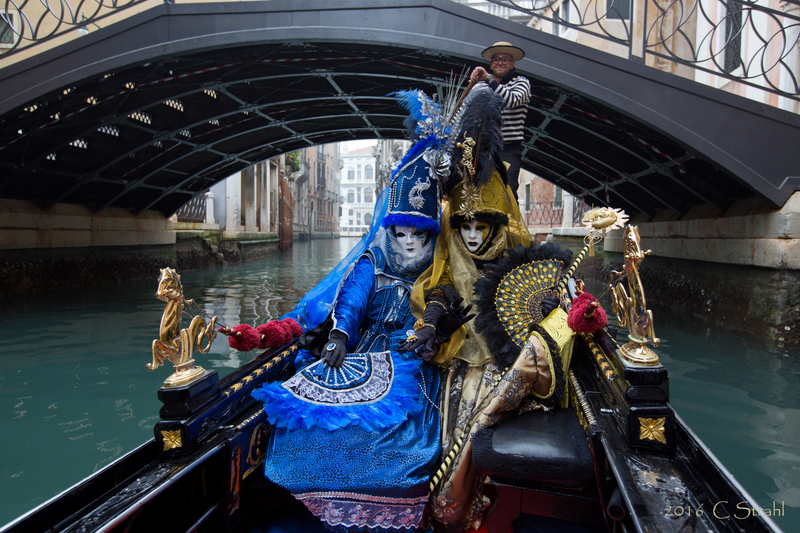 Two of the classic Venetian costumes are the Bauta and the Moretta. Bauta is composed of a black cloak (tabarro), a black tricorn (tricorno), and a white mask called larva. It tends to be the main type of mask worn during Carnival. It was also used on many other occasions as a device for hiding the wearer’s identity and social status. It was thus useful for a variety of purposes: some of them illicit or criminal, others personal, such as for romantic encounters. The Moretta is an oval mask of black velvet that was usually worn by women visiting convents. It was invented in France and rapidly became popular in Venice as it brought out the beauty of feminine features. The mask was accentuated with a veil, and secured in place by a small part in the wearer’s mouth. Carnival in Venice is a unique and dazzling experience, probably because this city has a particular glamour to it, especially during winter. Viareggio, on the Tuscany Coast, has one of the biggest Carnival celebrations in Italy. Viareggio’s Carnival is known for its giant, allegorical papier-mâché floats used in parades, not only on Shrove Tuesday, but also on the three Sundays before and the Sunday that follows. Festivals, cultural events, concerts, and masked balls take place throughout the Carnival season both in Viareggio and in neighboring regions, and restaurants have specialized Carnival menus. The artistic refinement of the papier-mâché masterpieces are admired as true works of art, similar to the luxurious masquerades in Venice. However, the oldest carnival celebrations in Europe are found at the Putignano Carnival in Puglia. Dating back to 1394, it was only during the Fascist era that this rural carnival developed into the more refined, suburban event of today. This was when the parade of floats, a favorite form of communication in Fascist culture, came into fashion. The first floats are said to have been made with straw and rags, then cardboard and wood, until the current technique of papier-mâché over wire structures was developed. The floats always have themes related to scathing political satire or current affairs, and feature giant caricatures of politicians or TV personalities. They are accompanied by troupes of costumed dancers and loud music to engage the crowds of spectators. The city of Ivrea, in the Piedmont region, has a very peculiar Carnival celebration called the “Historical Carnival of Ivrea,” which includes the characteristic “Battle of Oranges.” The spirit of the carnival lives through the re-enactment of the city’s liberation from tyranny dating back to medieval times. A baron who starved the city was driven away thanks to a miller’s daughter who roused the people to revolt. Today, the Battle of Oranges takes place in the main squares of the city between teams on carts wearing protective masks (symbolizing the tyrant’s guards with armor), and hundreds of orange-throwers on foot without any protection (the rebellious commoners). Together with all the historical events occurring during Carnival at Ivrea, the Battle of Oranges constitutes an incredible cultural and goliardic heritage, and it’s an event in which anyone can participate. In order to show their involvement, beginning on the Thursday before Lent, all townspeople and visitors wear the “Berretto Frigio” (Phrygian cap), a red stocking-like hat that shows their support for revolt and therefore their aspirations for freedom, as it was for the heroes of the French Revolution. The red hat is also a signal for the orange-throwers that you are a spectator and they will not throw fruit directly at you. If you want to witness this exciting event, take note of the routes that are meant specifically for visitors and spectators: they are usually marked by nets draped around buildings, which can shield you from the flying fruit. One of the best parts of Carnival is the special food that is only available during that time of the year. Today, many carnival traditions have vanished or changed, but fried pastries are still common in Fat Tuesday cooking. The gastronomy is very rich in fats and sweets. Spoonfuls of dough fried in oil take the shape of small balls, the so-called frittelle or castagnole. The main ingredients are eggs, sugar, flour, and butter. They are served with icing sugar; some Italians like to fill them with chocolate or custard cream. Chiacchiere (meaning chatter, gossip) are also common all over Italy and they assume many different names: frappe in Rome, sfrappe in the region of Marche, flappe in central Italy, cenci in Tuscany, bugie in Piemonte, sfrappole or nastri delle suore in Emilia, and gigi in Sicily. Despite the differences between names, the ingredients and method of cooking are always the same: flour, butter, sugar, and vegetable oil for frying. They essentially look like little, puffy biscuits, but have the light, crumbly texture of puff pastry. They are honey-colored and served with a sprinkling of icing sugar on top. As you can see, Carnival in Italy is all about fun! It is a time when the pressures of everyday life are forgotten in a joyous rush of celebration, where the rules that shape the rest of the year do not necessarily apply. It’s the last hurrah before the more serious and less frivolous Lenten period. The more wine, sweets, costumes, and parties during this time of celebration, the better! So join in the festivities but, as I said, be careful, because “A Carnevale ogni scherzo vale”—at Carnival, anything goes. This entry was posted in Countries and People, Current Articles by Qiong Wang. Bookmark the permalink.